I'm so happy to post about my first quilling tutorial in 2019! Yay! 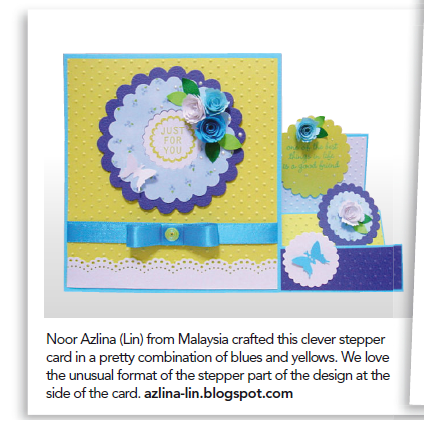 Been so long since I made a post here or even made a quilling tutorial. Took a long break from work since October last year because I was not well. To be honest, I'm still not well now but I'm slowly healing and I wanted to make this video for all those who are fans of quilling and are a fan of making quilling vortex shapes. A lot of my followers on Instagram have been requesting as well for me to make this video for them. They have been waiting so long for this. It may seem like I took my own sweet time to make it but that's only because I needed some time to make more experiments on it to make sure the flower looks identical every time I make it. I wanted it to be perfect so to speak because before this, I myself had a hard time making sure it looks the same every time I make it. So I couldn't make the video if I was not happy with it myself right?? Thank God that finally with a lot of patience, I managed to pull through, figured out what was wrong with my technique and got it right in the end. 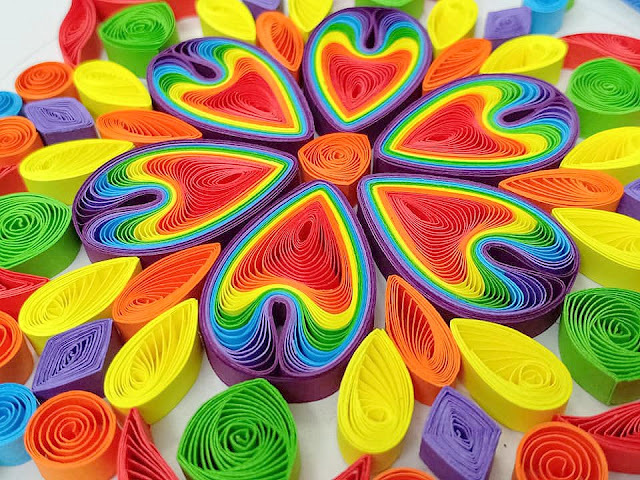 As always, I am using A4 80gsm colour printing paper to make my quilling papers. I cut them myself using a craft knife and sometimes with a razor blade. Measuring the paper is so important to make sure that each strip of paper is about the same width. For this flower, the measurement for each quilling paper used is 5mm x 297mm. I showed in the video the measurements in inches as well. So be sure to watch the video tutorial to find out the exact measurements. For each petal, I used 3 strips of the quilling paper. In this video, I will be teaching you how to make a triangle shape vortex using a flea comb. With the experiments that I have done before I figured out that we could also make with it using a slotted quilling tool but the result is not the same. I still prefer making it using the flea comb as the design looks much nicer. 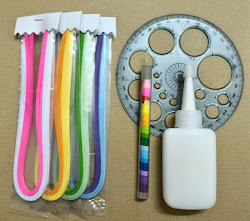 Once you know how the basics of how to make this triangle shape vortex, then you can easily make it in different colours or multiple colours in each triangle. You could also make them in different sizes. The longer the quilling paper, the bigger the triangle will be. 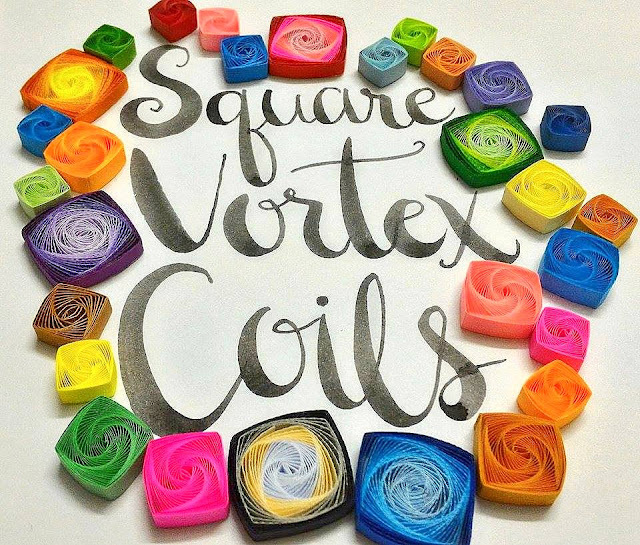 Sometime ago this month, I came to learn how to make vortex coils from a short video tutorial that I saw at my dear friend's Miyyah@Kertas's Instagram. I got so hooked up with it that I practiced making the coils a lot. The more I make them, the more I got hooked. The first try was not as nice and I was not 100 % satisfied with the results, but eventually I got the hang of it. I was quite happy with the outcome but I find it was really hard to make them. First of all, since my hands are pretty shaky most of the time, it was hard to hold the coils and make sure I didn't drop it while coiling it. My fingers hurt a lot in the process of making the coils because the process of rolling and pinching the coil really hurts especially when I used thick paper strips instead of thin ones. Not sure how other people felt when they make them, but I felt that way. After making lots of the basic vortex coils, I then tried to make squared ones. I didn't actually got it figured out right away. I knew how to make simple square quilling shapes but I didn't know how to get that vortex pattern inside the square. Then I figured that everything had to start with the basic vortex coil shape. Once I came to that realization, then it became very clear what I should do in order to get that square vortex coil pattern. As promised, I have made a video tutorial on how to make the square vortex coils. So many people have requested for me to make it. It is not easy to explain with mere words on how to do it, so making a video is the best way for me to get the idea across. Just the other day, I thought that I could only use maximum four colours using the shell shape quilling method But yesterday I realised that I could use more than that! I was just playing with the thought of using rainbow colours and tried it out first with my shredded papers to see if it could work. To my surprise, it did work although it was very time consuming and difficult to handle. The shredded papers were a lot more difficult to handle because they are very small. 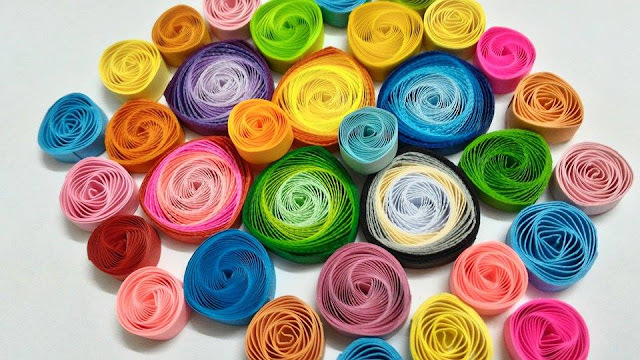 They are 3mm wide and it seems that it's easier to use the 5mm quilling papers than the 3mm ones because when you've finished combing all the coloured papers, it's difficult to push the 3mm papers with the tweezers. So, I used the 5mm quilling papers instead. I really love how the petals turned out looking like heart shapes instead of shell shape. Especially the red and orange papers inside each petal. They really stand out. Click on the photo to buy the kit!! !